Earlier this month, Cafe Linnea played host to Taste Alberta‘s most recent Prairie on the Plate dinner. Many are surprised to learn that Cafe Linnea is open for dinners, as the restaurant first became known as a all day breakfast and brunch spot when in opened in 2016. Well, I am eager to help spread the word that chef Kelsey Johnson and her culinary team are serving up a fantastic dinner menu at Cafe Linnea. In addition to the regular dinner menu available Wednesday to Saturday nights, guests can experience a two or three course chef’s choice menu for $35 and $45 respectively. Including an amuse bouche to start the meal, I think it is one of the best dinner deals going in Edmonton. Since the restaurant opened, chef Kelsey has used local ingredients in ways inspired by her French and Scandinavian heritage to create a menu that is unique to Cafe Linnea. Her focus on Alberta grown, Alberta raised, and Alberta produced products made Cafe Linnea a perfect fit for a Prairie on the Plate dinner. While every chef’s menu at Cafe Linnea could be an ode to Taste Alberta’s commodity partners, on March 7, 2019, chef Kelsey shared a Prairie on the Plate menu which made ingredients from Alberta Turkey, Alberta Canola, Egg Farmers of Alberta, Alberta Milk, Alberta Pulse Growers Commission, and Alberta Pork shine. To start things off, chef Kelsey shared what has become a signature canape for Cafe Linnea. The bright green pea pancake topped with house creme fraiche and house smoked ham was inspired by a challenge from Alberta Pulse Producers during Northern Lands – The Great Canadian Wine and Culinary Adventure. Chef Kelsey won the pulse challenge at that event with this colourful two-bite dish incorporating Alberta grown, split-green peas. For our first course of the evening, chef Kelsey showed Alberta Turkey Producers some love outside the traditional turkey-time holiday season. For the event chef Kelsey, who thinks that dark turkey meat is underutalized, cooked turkey legs and drums in sage to inspire the flavour of Christmas, and paired the rillette with bright Luxardo cranberries and brioche. 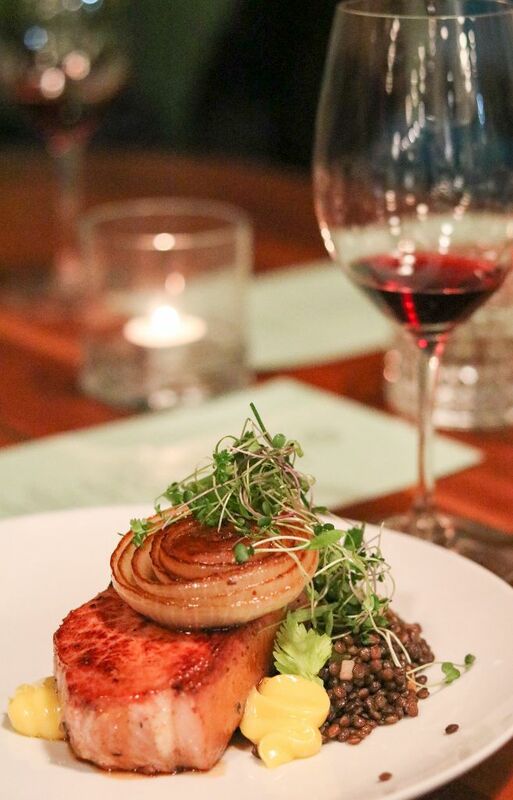 The Serben Farms pork chop topped on warm lentils and served alongside a rich cold-pressed canola oil emulsion and perfectly port caramelized onions that chef Kelsey served is one of the best dishes I have eaten this year. Our main course emphasized how when comfort food is done well, simple yet high quality ingredients can shine on a plate. Chef Kelsey’s brined pork chop transformed an affordable and classic cut of pork that I grew up into the most succulent of pork dishes. After my adoring words of appreciation for the dish, chef Kelsey shared the full recipe. Chef Kelsey shared what she considers the most comforting desserts she can think of – a classic pudding chomeur. The dish translates as unemployed person’s pudding, is said to have been born in Quebec in 1929 by female factory workers who had access to only basic ingredients in their industrial neighbourhoods: butter, flour, milk, brown sugar. While the original would have been made without eggs, the depression era dish has evolved to include some present-day accessible ingredients. The sugar crusted topping was still bubbling when the ramekins arrived at the table for our dessert course. To help cool them down, and add some richness, our server delivered a mini pitcher of fresh cream (thank god for Alberta Milk producers).